My babies have all loved to be swaddled. It helps them relax and sleep well, and more sleep for baby means more sleep for mommy! 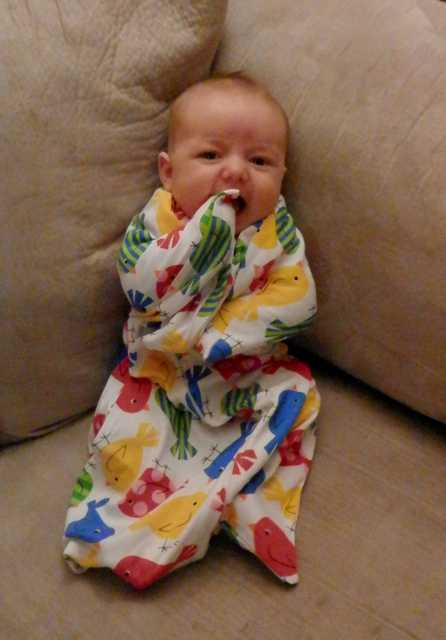 Unfortunately, around three months old my babies are able to wriggle their little hands out of their swaddles. They scratch their little chins and wake themselves up. By four months old, they can completely bust out of the swaddle in a few seconds. They still have the startle reflex, and should be swaddled, but they break out so easily, it doesn’t do any good. I always call this the fourth month sleep regression, because no one is sleeping anymore! The Sleeping Baby has created the perfect product to transition your baby from swaddler to free sleep, and help everyone get a good night’s rest. It is called the Zipadee-Zip. 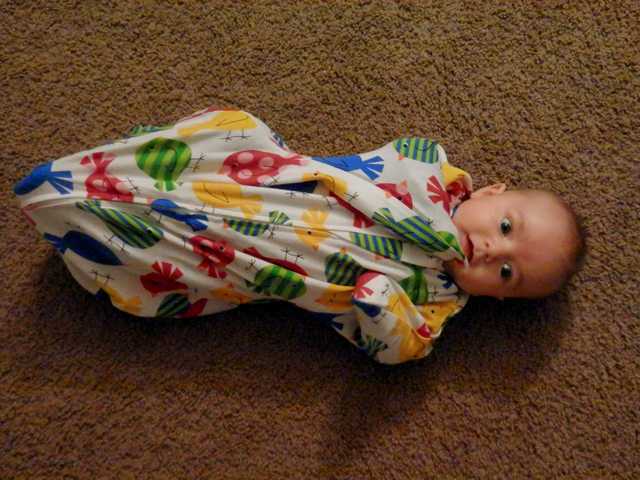 The Zipadee-Zip is a swaddle transition sack. It is perfectly designed to allow babies access to their hands, while still helping them feel cocooned. When a baby throws out their arms, it is called the Moro reflex. When their arms meet resistance, they settle back to sleep. If they don’t meet resistance, they will startle and often cry. 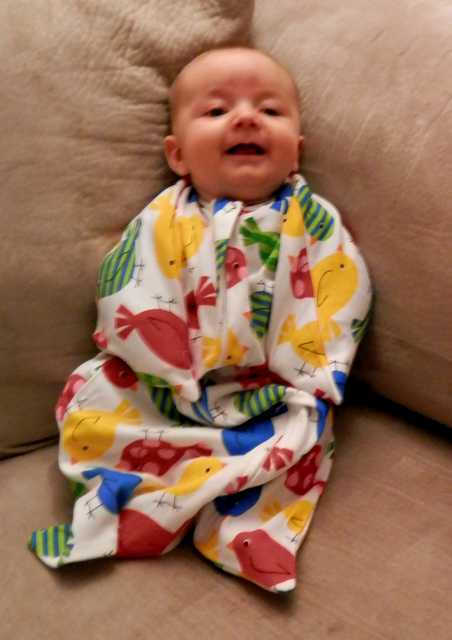 This is why swaddles work so well; they keep infants’ arms from flailing and startling them. As you can see, my son can keep his hands near his face, but if he begins to startle, the fabric creates a boundary. Each Zipadee-Zip is made of cotton and flame resistant modacrylic. Sleeping Baby is committed to using only the finest materials. They, also, do not treat their fabric with toxic chemicals, unlike other sleep sack companies, so they are perfect for your baby’s sensitive skin. 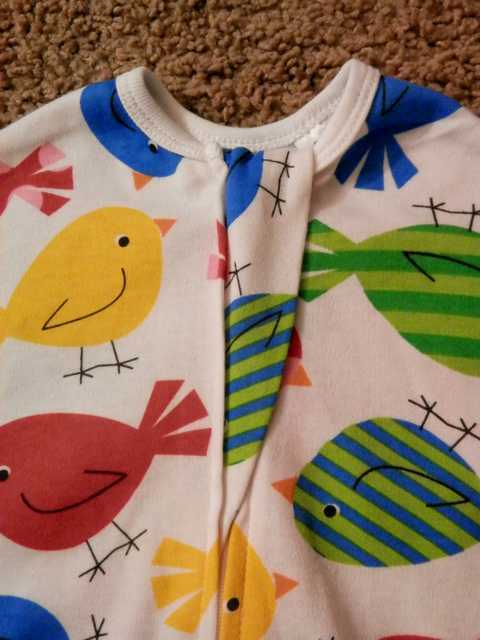 The Zipadee-Zip is light-weight and perfect for layering with baby clothes and jammies. The Zipadee-Zip is made with a fabric zipper cover, so your little one won’t get pinched or scraped. The Zipadee-Zip is not only a sleep sack but is also great for in the car seat. Unlike traditional swaddles, you can safely buckle your child in their carseat, while they are wearing the Zipadee-Zip. Fluffy coats and car seat pads are dangerous, in the event of a wreck. The Zipadee-Zip is the perfect way to keep your baby’s little hands warm and keep them comforted, without compromising their safety. The Zipadee-zip is also perfect for doctor’s appointments. You no longer have to pull your baby out of layers of clothes, simply unzip, and your baby is ready to be weighed and measured. The Zipadee-Zip is also a great way to protect your baby from germy surfaces in the store or while traveling on planes or public transportation. My son still has a pretty strong Moro reflex, but we’ve been using the Zipadee-Zip during nap times. My son snuggles in and quickly falls asleep. He is able to sleep with his hands near his face (without scratching himself), which has been his goal since birth. He is taking good naps again, and that makes me one happy momma! Sleeping Baby has offered ILMK readers an exclusive coupon for their Zipadee-Zip. Simply enter the code SLEEP,when checking out, to receive $2 off your own Zipadee-Zip. Sleeping Baby has also partnered with ILMK to offer you the chance to win a Zipadee-Zip, in your choice of pattern. To enter, simply fill out at least one entry below, but remember that the more entries you fill out, the better your odds of winning. The giveaway will end on 10/24 at 12:00 a.m. The winner will be notified by email and have 24 hours to respond. Good Luck! Congratulations to our winner: Elizabeth Hill! Disclosure: I was given a complimentary item to facilitate my review. I was not required to give a positive review. My opinions are my own. Your website given didn’t work for me, and I tried searching the web too, but didn’t see prints, so I’ll say I like the birds. Prefer a boy print. I love the Little Hoot Zipadee Zip! I love the Little Hoot Zipadee Zip. I love the Little Hoot Zipadee Zip!!!!! I like Monkeyin Around pattern for my new grandson due in December! love the Monkey one, so cute! Starrtly night is my favorite! I like little love bug for my little bug! I love the ‘Look Hoo Loves You! FLEECE’!! 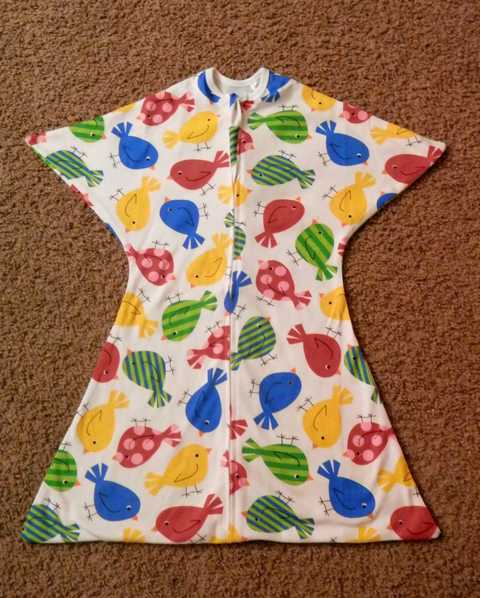 It’s perfect for our bitter cold Wisconsin winters and could be for a boy or a girl. Thanks for the chance to win one!! I love the one with horses. I love the look hoo loves you pattern with dots of fun being a close second! I love this in little hoot! I love the starry night one! Love the Starry Night Zippy! Little Luv Bugs is definitely my favorite! Couldn’t find where to leave a comment, but here is my favorite! The Monkey’s!! Due any day now. Would love to win a zipadee-zip! My top two zippies are birds of a feather & starry night. Cannot wait to try zippy on my little one! i love the helicopter one! Love the helicopters! Woo hoo! I love all the solid zippys! I love the eLOVEphants. I so want a small for my buddy. My daughter is desperate to try one with my almost six month old grandson. He has baby eczema and wakes and scratches. Needs a size medium…you can choose the pattern. My little guy loves his hands in his mouth. I wonder if the toddler one is a better choice. It’s worth a try though, I hope to win. These prints are adorable. I love the start night. Like every new mom, I keep hoping for that magic product that’ll help my baby sleep better. Maybe this is it! I love any of the patterns that have owls on them! Would love to win the trucks in a size small! I have two favorites! Trucks & helicopters. i love the monkey pattern! Starry Night is my favorite! I really need one of these to help with our transition out of the rock n play. I love the elephant & heart pattern! Starry Night is my favorite. After 3 girls I just had a boy! Starry nights or dots of fun…love them both! Would love one! Thank you for the opportunity!! Elephants are awesome. I love the elovephant! I am sad that it is only available in large now though. My baby is only 5 weeks old. I cant wait to get one of these when he is a little older. I already have eLOVEphant and would love to get Starry Night! I love the eLovephant print! Super cute and gender neutral! Our LO is 2 months and hated being swaddled from the moment he was born. We got our first zippy a few weeks ago and its allowed him to sleep 10+ hours in his co-sleeper, only waking once to eat! I love that it allows him to sleep on his tummy, since this his favorite! I have been telling every mom I know about our Zipadee Zip!!! We have the Hooty Hoo Owl print which is super cute, and can’t wait for the penguins to come out! I love the starry blues and the giraffe jungle! I love the eLovephant and starry night prints! Love this product. Can’t wait to try with my 7 week old! I have a zippy and it works great for our little guy to self soothe. Would love to have two to rotate! It’s very hard to just decide on only one that I like best because they are all so CUTE but I think I would love the giraffes or the elephants for my son! I would love the giraffes or elephants for my 7week old! I want a zippityzip Sooo bad. Love the hearts one but they all cute!! When will they get smalls??? Gah! I love the LOTS O’ LIME! Little hoot print is my favorite 🙂 My 4month old daughter is working on rolling over and is usually swaddled and this would be the perfect transition for us! Starry night of those currently posted. Love the owls and starry stars look forward to get zippy for my granddaughter. She is due today! WOULD LOVE A “ZIPPY”(AS WE CALL IT IN MY HOUSE). WORKS WONDERS FOR MY SON! I love the monkeyin’ around print! I love the monkeyin around print! Been dying to try the zipadee zips! Hopefully they will be available soon, thanks for the review. I can’t wait to try one of these for my little one!! A friend at work saw them on TV and fiLLed me in..
I’d love the elovephant print or the zig zag pink/lime pattern for my new baby girl! I love the starry night pattern! I love the Birds of a Feather and Look Hoo Loves You! I can’t wait to try one! I love the Birds of a Feather and Look Whoo Loves You! I can’t wait to try one! I love the Birds of a Feather and Look Whoo Loves You! I love the eLOVEphant for girls and the Helicopters for boys! We love the zipadee zip! It’s changed how we all sleep in our home, great product. We love the zipadee zip! It’s changed how we all sleep in our home. Starry Night is definitely my favorite! I love the Pink Bunny Dots! I’d love to win a size small for my little girl! Love Lots O Lime. Good for both boys and girls! I love the look who loves you. Love Lots O Lime. Good for both boys and girls. Birds of a Feather! So cute! I LOVE We All Scream For Ice Cream!! I love the hoo love you print! I just got the starry night pattern for baby Sawyer. I also like the starry blues pattern. I just got the starry night pattern for baby Sawyer. I have a granddaughter who gets up 5-7 times a night. Would love for my daughter to try one of your sleepers. Would love for my daughter to try a sleeper on her daughter, she wakes up 5-7 times a night and is 7 1/2 months old now. We’re about to transition from cosleeping to her own crib, so I’m really hoping this eases the transition! I have a terrible sleeper. Looking forward to giving the zippadeezip a try. Looking forward to giving the zippadeezip a try. I would love to try one!!! Love the elephants and the cute birds! Love the elephants and the cute birds. I love the Lot’s O Lime pattern. I don’t know what I’m having yet and that would be perfect for boy or girl. We love our zippy!!! Can’t wait for more to come in stock. We love the elephant pattern. i love Lots o Lime!! I like the eLOVEphant one. Super cute. So cute! Have always wanted to try one. I like the Lots of Love pattern. My son loves his small zippadee-zip! Would love to have an extra so that we always have one ready to go when the other needs to be washed. We love zippee’s in this house! They saved my sanity! We have the garden print and the pink polka dot one but I love the one with elephants too!! I like the starry night one. I love the lots o love zippy!! I love the starry night pattern!! I NEED the lots of love zippy!!! We already have the chevron patter. But we love the little pony pattern!!! We love the little pony pattern!!! We love the Chevron pattern!! We “NEED” the lots of love or pink polka dot zippy!!! I love the starry night pattern!!! And the lots i’ lime pattern!!! I love the starry night pattern!!! And the lots o’ lime pattern!!! I like the eLOVEphant design! Can’t wait to try these!